Forever stamps featuring Jimi Hendrix come out Thursday. Jimi Hendrix fans have something to celebrate. The U.S. Postal service released an limited-edition Forever stamp Thursday featuring the Rock and Roll Hall of Famer. The stamp comes out decades after the musician died in 1970, when a stamp cost just 6 cents. Today, one costs 49 cents. It is designed to resemble a vintage 45 rpm record sleeve and shows Hendrix wearing one of his trademark military jackets and playing a guitar. 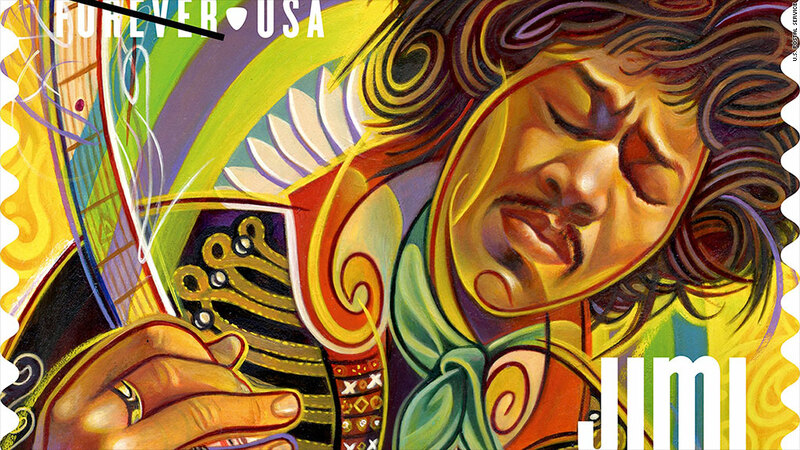 "Jimi Hendrix helped found three new genres of music — heavy metal, jazz fusion and funk — and in doing so, left behind an indelible mark on pop music and popular culture generally," said Joseph Corbett, CFO and executive vice president at the postal service, in a release. The stamp will be unveiled at the SXSW conference Thursday with a concert including celebrity guitarists like Guns N' Roses' Slash and Robby Krieger of the Doors. Last year, the Postal Service honored other musicians such as Johnny Cash, Ray Charles and Lydia Mendoza as part of its new music icons series. Janis Joplin is expected to be added to the list this year. The agency is hopeful that excitement over the musician series might get more people to buy stamps as it grapples with deep financial problems and looks to find new revenue streams. "The popularity of the music series demonstrates that there's still a considerable interest in stamps and stamp collecting," said spokesman Roy Betts.